Virginia Gov. Bob McDonnell (R) is "missing the target when it comes to whose interests he's really looking out for" but "then again, that's nothing new for us, is it," MSNBC's Dylan Ratigan complained in the "Busted" segment of today's program. Ratigan lamented that McDonnell stripped out the National Crime Prevention Council (NCPC) as an alternative organization that Old Dominion educators could select for gun safety instruction for elementary school students. As it stands now, the National Rifle Association's "Eddie Eagle" program is the only option public school teachers have under state law. Perhaps Ratigan is unaware that the Eddie Eagle program "neither offers nor asks for any value judgment concerning firearms," it merely instructs children in four simple steps about what to do should they come across a gun: "Stop. Don't touch. Leave the area. Tell an adult." Discuss with students the dangers of guns. Review what they should do if they find a gun. Share with them that when people die from being shot, they can no longer do good things for their families or for society. Assign students to groups of four or five, and have them select a historical figure who was killed by gun violence. Possiblilities include Martin Luther King, Jr.; John F. Kennedy; Abraham Lincoln; and Mahatma Gandhi. Have each group research the person they chose and list the positive contributions he or she made to society. Ask students to predict how these individuals might have continued their work if they hadn't been killed by gun violence. Have each group present a biography of the individual they researched and their ideas of what the individual could have done if he or she had not died from gun violence. Have each member of the group write a diary entry that takes place five years after the person died and shares what the person could have done if the person had lived. The students may choose to write the entry from the point of view of the individual or of a third party who had been influenced by the individual's work (e.g., someone who heard Martin Luther King, Jr. give a speech). Extend this into a service project by having students design a memorial for people killed by gun violence. They may choose to plant a tree or design a peace quilt to display in the school's lobby. 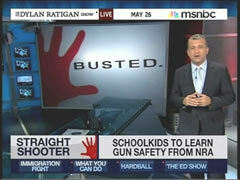 That sort of indoctrination is hardly in the public interest, but don't expect Dylan Ratigan to question conventional thinking when it's far easier to toe the liberal line and bash the NRA.